When you’re trying to stay healthy, it’s easy to fall into a boring routine that has you eating the same thing again and again. But if you’re feeling bad that you eat scrambled egg whites four times a week, Kim Kardashian’s latest diet revelation will make you feel much better about your eating habits. The reality star has been grubbing on the same salad every single day. 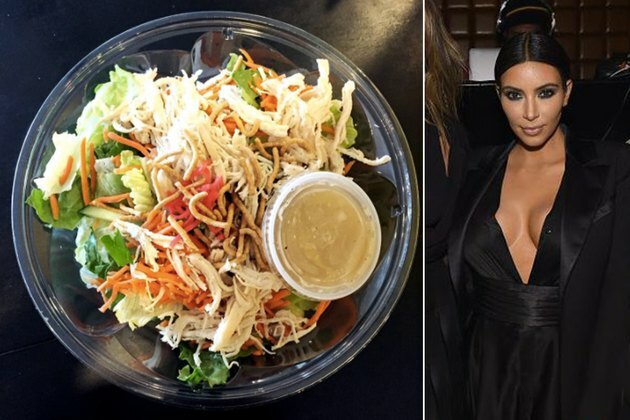 Kardashian, who recently told Andy Cohen about her go-to meal on “Watch What Happens Live,” says that she eats a Chinese chicken salad “every single day.” But not just any old salad place will do: Kardashian’s daily rationing of sesame-covered greens has to specifically be from Health Nut in Calabasas, California. So what does a Health Nut Chinese chicken salad entail, exactly? Shredded romaine and iceberg lettuces, shredded chicken, chow mein noodles, pickled ginger, carrots and a sesame dressing. The whole Asian-flavored shebang comes in at 230 calories without dressing. If you want to amp it up with some sesame tang, you’re looking at another 220 calories. Considering that the dressing alone is nearly the same amount of calories as the entire salad, we’re thinking that Kardashian probably keeps the dressing on the side. Metro reports that the 38-year-old has been working out vigorously since the birth of her son and (obviously) adhering to a strict diet in order to get back to her goal weight of 120 pounds. But it’s not just the sneaky salad dressing that Kardashian — or any of us — should watch out for when trying to eat healthy. We’d suggest going light on fried starchy foods like the salad’s crispy chow mein noodles. They’re tasty, but the calories add up, and the refined carbs are digested quickly, leading to a surge — and crash — of blood sugar. So the next time you’re feeling like a weirdo for eating the same overnight oats for the fifth time this week, go easy on yourself. Remember: Kim Kardashian gets in food ruts too. Do you eat the same thing every day? What do you think of Kardashian’s go-to salad? What’s your favorite healthy salad? Let us know in the comments.